Where better to start than with the sole surviving movement of Jean-Baptiste Singelée’s Grand Quatuor concertant, composed just 21 years after Adolphe Sax unveiled his ophicléide à bec. It’s a sprightly number that exploits the range and character of each instrument. More important, it demonstrates the astonishing quality of this ensemble, whose intonation, articulation and blend are faultless. Factor in a wonderful sense of ease and affection and you have terrific opener. And the praise doesn’t end there, for the recording, made in what sounds like a most grateful acoustic, is warm, detailed and uncommonly nuanced. Next up is Gabriel Pierné’s Introduction et variations sur une ronde populaire, written for the French saxophonist Marcel Mule and his Quatuor de la Musique de la Garde républicaine. It’s something of a staple, but then it’s not difficult to understand why; unusually, it combines the weight and sonority of a wind band with the deftness and transparency of a string quartet. In this recording the timbres of each instrument – the lower ones especially – register in a way they seldom do. As for the players, their clean, propulsive delivery is a joy to hear. Shrewd programming is essential to the success of collections such as this, and I’m pleased to report there’s not a dull moment here. The soulful start to Eugène Bozza’s Andante et scherzo underlines the jazz-inflected, almost improvisatory nature of the piece. The playing is wonderfully agile, particularly in the animated second half. But that’s not all, for the Ferios infuse everything they do with such a lovely, engaging personality. Moreover, there’s a tantalising sense of musicians making music just for you, and that’s a rare privilege. As ever, the sound is splendid, and that adds immeasurably to the feel of being there. In fact, this is one of the finest Chandos recordings I’ve heard in recent years. The most substantial work here is van Merwijk’s Ciudades (Cities). It’s a mini-travelogue, a set of musical snapshots, that conveys the essence of places for which the composer has a special affinity or affection. Sarajevo has a haunting, muezzin-like call at its core, not to mention vital, dancing rhythms. The imaginative writing and, not least, the supple playing, left me slack-jawed with admiration. Tokyo is all bustle – what articulation – and Cologne is more of a dark meditation; Córdoba and Montevideo brim with interest, and Addis Ababa has an open-hearted vigour that’s most beguiling. Van Merwijk really knows how to write for this combo – hardly surprising, as he played baritone sax in the Aurelia Saxophone Quartet for 30 years – and the range and colour he draws from these instruments is just exhilarating. Needless to say, our feisty foursome are well up to the challenge. Indeed, if you download just one work from this album it must be this one. As for The Wordsworth Poems, they’re spare yet gently evocative, the transparency of both the playing and sound chiming perfectly with these changing moods and vistas. Really, ‘thumbnails’ such as these don’t do justice to the quiet artistry of this quartet, whose playing in Hugo Reinhart’s wide-ranging and highly virtuosic Quartet in F minor and Will Gregory’s Hoe Down is every bit as assured as anything else in this delectable programme. The insistent, fiddle-like rhythms of the latter will surely bring a smile to your face – they did to mine. My only quibble – and it’s a very minor one – is that Ingrid E. Pearson’s otherwise excellent liner-notes don’t follow the order of play. That said, the bold sub-headings do help when scanning for a particular piece. 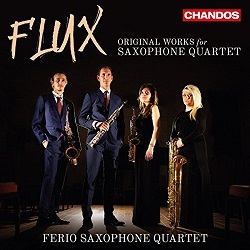 If anything, these brief comparisons confirm just how gifted the Ferios really are; they also underline the sheer presence and tonal sophistication of this new recording. I’d say the Chandos sound compares very favourably with that of the Tetraphonics album (Cybele). In short, Flux is the perfect calling card, and it should win the group lots of new friends and followers. It also bodes well for the rest of this series.